Join us on a guided moose tour, by foot, to meet the royalty of the Swedish forest, the mighty moose. During the two hour tour you will learn lots about moose as your guide tells you the story of this giant and noble deer. You’ll learn how to spot them in the wild, and how they fit into the ecological system here. The guide will explain to you their powerful stature and their athletic ability. You’ll also learn about why they are fearless warriors when required, these are seriously tough animals of the Nordic forests. The bull is not called The King of the Forest for nothing, and the female really is the Queen. 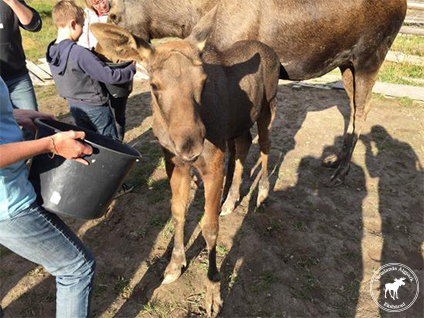 We take you up close and get you personal with our moose – no one in the world can take you closer to living moose. You can touch them and feed them here, and stand next to the king himself and touch his crown. The sound of a moose bull breathing as you stand next to him looking up at his eyes and crown is a powerful moment for many. This is a unique tour experience, not to be missed while you’re here in Värmland, Sweden.